It’s not. Let me explain. I hear the same problem over and over. Sales and marketing aren’t doing a great job of executing lead generation because they both believe it’s the others job. And you know what? They’re both right. Here’s what I mean. Companies don’t typically call what salespeople do “lead generation” or “demand generation.” Instead, they use terms like prospecting, business development, pipeline development or social selling. Even with the increase of content marketing and inbound marketing, I find salespeople get stuck carrying the load of prospecting for their leads. And they waste time struggling to get their foot in the door to find people who want talk to them. So why do salespeople cold call, cold email, and prospect? One simple reason: they have no choice. Marketing rarely generates a sufficient volume of qualified leads. It’s not because marketing can’t or won’t. It’s because marketing typically doesn’t get the funding necessary. So salespeople have to pick up the slack. The mandate for most sales organizations is, make more calls, send more emails. B2B marketing is going through a modernization to align better with how people buy. Now it’s time for sales. According to Jill Rowley, “…we’re long overdue for transformation, a modernization of the way we sell…” Read my interview with Jill Rowley Chief Evangelist and startup advisor on better social selling. The high-performing salespeople I’ve met don’t spend much of their time prospecting. They network. They get referrals. And they leverage their social network via LinkedIn and Twitter, and monitor news feeds about key accounts. They practice social selling. When done intentionally, these activities are very practical and do not take up a lot of productive selling time. The rest of their pipeline will come from sales-ready leads from marketing. A well-crafted, researched, intentional lead generation strategy can’t come from sales. Why? Because their focus is on the immediate and near-term revenue and quotas to fill. Lead generation done right requires an ongoing commitment that marketing can best fill. The job of marketing is to develop leads that match the buyer’s expectation to buy and the seller’s expectations to sell. Otherwise, you’ll have a serious disconnect. This why account based marketing is getting so much attention. Salespeople should not feel stuck with the old, worn-out tactic of cold-call prospecting. They need to do what they do best: sell to potential customers that have qualified as sales-ready. This is where inside sales and sales development reps are filling the gap. For more on this read, The Biggest Contributor to B2B Revenue. In tech companies, much of lead generation has been taken over completely by marketing which generates marketing qualified leads that are routed to inside sales reps, or SDRs, for qualification and nurturing. This allows sales to focus solely on developing relationships and closing new business. But outside of high tech, lead generation is still mostly done by salespeople. Who should own lead generation: sales, marketing or both? To get a broader perspective, I asked the 19,734 members of my B2B Lead Roundtable LinkedIn Group about this topic, and I got some great feedback. The following comments are from our group discussion. What’s worked for you to get better sales and marketing collaboration? Lead generation is a part of both sales and marketing job to generate revenue. But how exactly they accomplish it is different. It comes down to collaboration. You need to work together on topics ranging from revenue goals backward to opportunities and qualified leads. Additionally, you need to get alignment on messaging, ideal customer profile, universal lead definition, qualification criteria, and lead routing. In sum, treat lead generation as a shared responsibility to generate revenue, and understanding who is doing what, and improving collaborating you’ll achieve better results. The post Who should own lead generation for a complex sale? appeared first on the B2B Lead Blog. Great article and points of views from many. 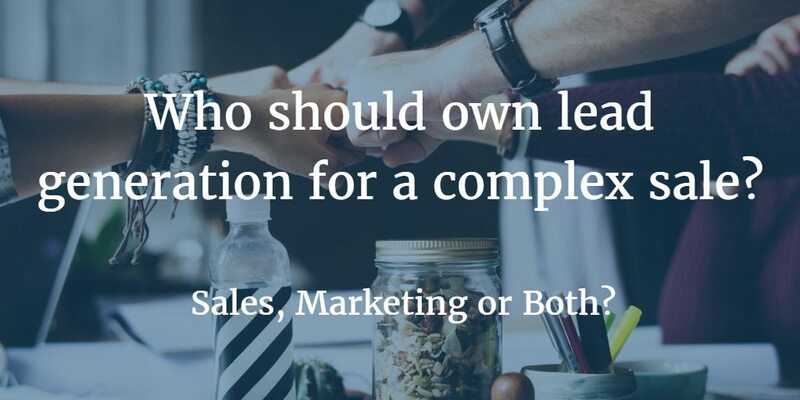 I agree that lead generation is a part of both sales and marketing responsibilities, but the key is how you decide on the distribution of it between the two. It is not “one size fits all”; rather every company and sales process is different and special to that company. As a marketer, I found it effective to collaborate with sales at each company to find the best solution for their environment, revenue goals and past performance. Then, we jointly decide and agree on a distribution of the percentage of lead generation that is owned by marketing, inside sales and sales, while you fine-tune and optimize it as you go. In some companies, you also have to include your channel partners. In summary, the answer to this important question is not who owns it; rather what’s the formula for each company and who owns what percentage!